This article was originally posted on 2/19/2013 and has had several updates as both machines and milk suppliers have changed and shifted. Thinking of fluffy micro-foam on top of a cappuccino or rich silky, creamy micro-foam for a flat white or latte? (Oh and you want it to be almond milk?) Nespresso Creatista Plus seems to be a great option. A few weeks ago, our De’Longhi Nespresso Lattissima Plus finally gave up and started leaking out the sides. It was a strong machine lasting 5+ years and we’d still recommend it. However, this leaking machine meant that we were on the lookout for a replacement. Our first thought was to go lean and mean by getting a basic Nespresso machine along with a new Aeroccino. Then we stumbled upon a demo of the Nespress Creatista Plus. A couple hours later and we were unpacking the machine at our house. Three weeks later and we’re extremely happy with it. ~$399 “Nespresso Creatista Uno” – This model has a plastic shell all around and 6 buttons allowing for adjustment in coffee volume, foam volume, and foam temperature. ~$499 “Nespresso Creatista” – This model has a chrome front with plastic sides and an LCD menu system for drink selection and finer adjustments of coffee volume, milk volume, and milk temperature (5 settings). This model has a ~10 second heat up. 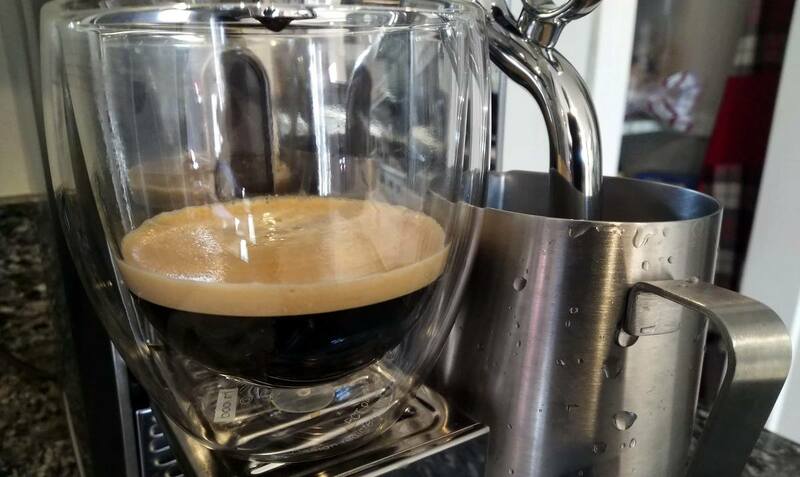 ~$599 “Nespresso Creatista Plus”- This model has chrome front and stainless steal sides along with an LCD menu system for drink selection and finer adjustments of coffee volume, milk volume, and milk temperature (11 settings). This model has a ~3 second heat up. The automatic wand operation is easy. You just add milk, select your desired option, and then push start. No need to hold the jar or move it around. Just leave it until it’s done. Once done, just pour or scoop out the rich foam. For almond milk, we have been setting the temperature on the lowest “very hot” setting. Overall using this machine both easy and fun. Cleaning is much easier than the Lattissima. With the Lattissima you had to manually run a steam purge, store the milk container in the fridge, and clean it every few days. With the Creatista, you just wipe the milk of the wand, then release it back to its resting position where it does an automatic steam purge. Easy. So far we’ve only tried Whole Foods Organic Almond Milk and it’s worked great. We are using the unsweetened variety. As of later 2018 and through 2019 (so far) Whole Foods is back and working wonderfully. Ugh. It seems both Trader Joe’s and Whole Foods are back to having quality control issues. One batch to the next it could be great or bad. After dozens of great results from Trader Joe’s Almond Milk we just had 3 cartons that produced sad bubbles. Luckily a recent batch of cartons from Whole Foods are working great. To illustrate how big of a difference this is, check out the pictures below. We’ve made the switch to almond milk and for the most part could not be happier. 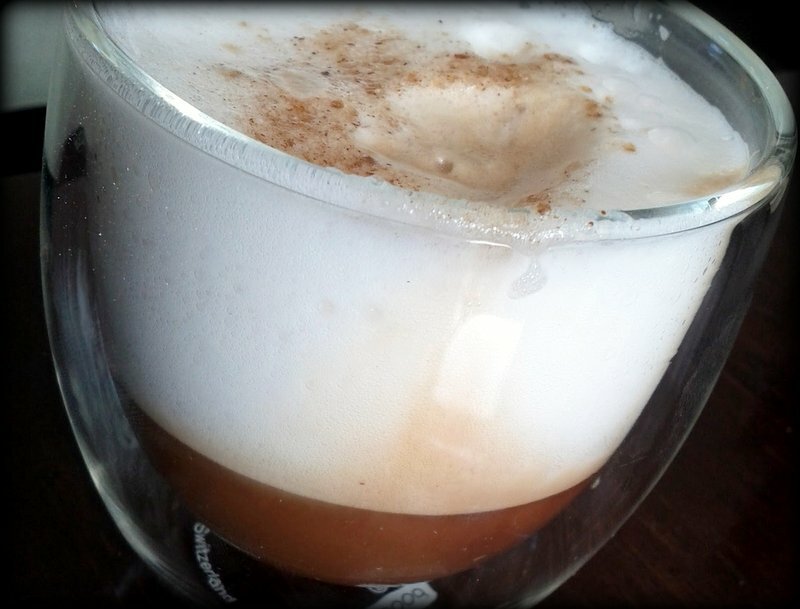 The biggest challenge so far is finding an almond milk that froths/foams for use in such drinks as a cappuccino. What we want is the thick rich foam that you can just pour (or scoop) into the cup and that holds strong consistency. To make your cappuccino “dryer” you can let the foam sit for an extra minute or two and then scoop it out with a spoon. 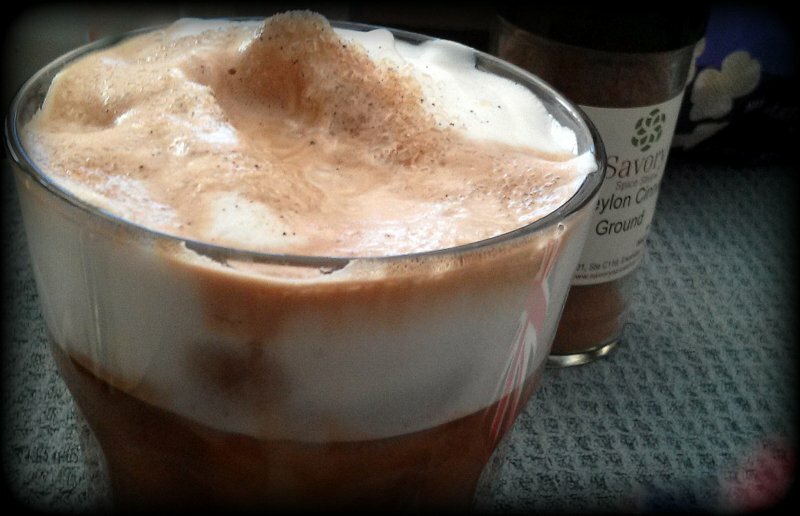 The foam is not just a “topper” that covers the coffee. A “topper” is much closer to a latte consisting of mostly steamed milk mixed with espresso and a scoop or two of foam on top. 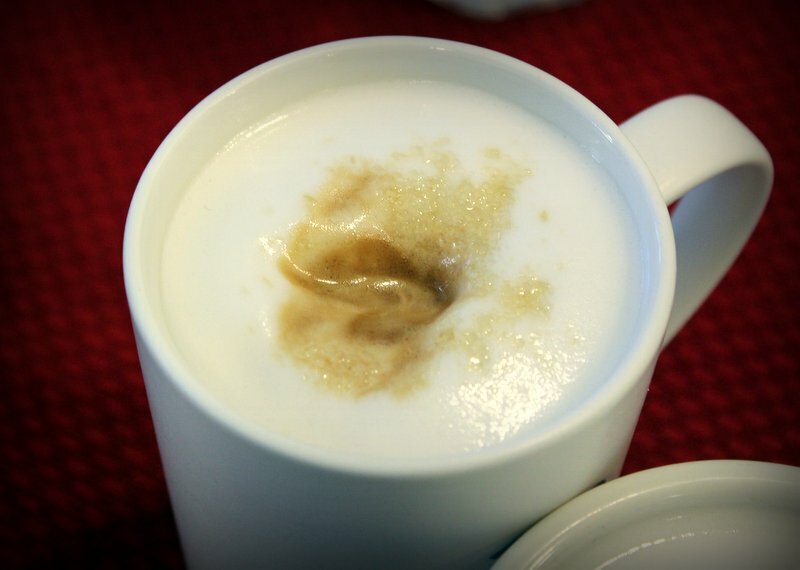 With a cappuccino, it’s a lot of foam infused with a shot or two of espresso. 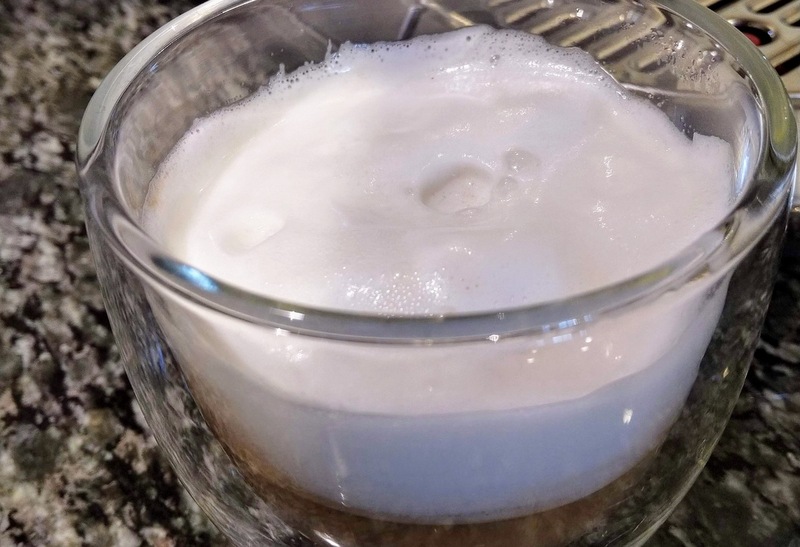 Taking it a step “dryer,” a common variation of the espresso macchiato can be made in the same manner, but using just a scoop or two of foam. Answer: Foam! We are not looking for big soap bubbles here. You want rich small/micro-bubble foam that keeps a pretty strong shape. 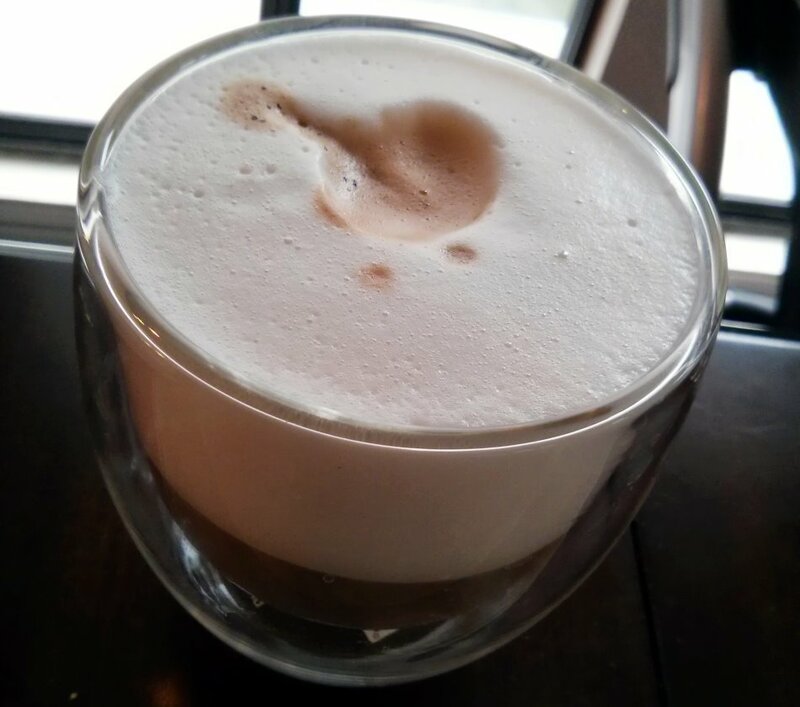 Notice how after pouring the shot of espresso in the drink below, the foam just has a small crater and keeps its shape. Again, 3/4 of this drink is made up of foam, leaving 1/4 for the shot of espresso and a bit of the steamed milk. Below is a picture of an iced cappuccino. The foam to espresso ratio here is a bit different. This is mostly caused by the ice melting as the hot shot of espresso is poured over it. Also, I use a lot of ice. So the coffee part that you see here is still filled mostly with ice. Frothers – What works best? Froth Au Lait still makes the best foam. That said, the company is out of business and the machines are not the best build quality. We still have one, it’s somewhat loud, doesn’t heat that well, but nice foam production. Nespresso/DeLonghi machine with built in frother. This auto froths and steams cold milk at the bush of a button. It’s built into the Nespress pod brewing system as well. It does a pretty good job though we have moved away from it as our go to. This is a stand-alone offering from Nespresso in that it is not attached to the actual machine. It is sold independently and in bundles. This unit will heat the milk and uses a small disc-like spinner at the bottom to foam the milk. It does a surprisingly good job (if the milk is right) though not quite as good as the Froth Au Lait on foam. Still this is our current go to option. ** Sadly the quality and consistency of almond milk seems to change every now and then. You can track some of the Whole Foods saga below under “Update on Whole Foods.” Due to this constant shift we will try to update as store brands ebb and flow on quality. We are now back to using Trader Joe’s brand instead of Whole Foods after the recent formula change (Spring 2018). We’ve been experimenting with blending the milks to get that closer-to-perfection foam. If you are not getting think enough foam, try mixing in 50% Almond Breeze. Note, the Almond Breeze does have Carrageenan. All ingredients and nutritional information remain the same, but something clearly has changed. In 2013, we contacted our local store and Whole Foods corporate. They said no ingredients have changed and they will look into it. Perhaps it’s just a quality control issue on some of the ingredients. Recently we have contacted Whole Foods again due to the recent formula and carton change in Spring 2018. We’ll update when/if we hear anything. 2013: whole foods had some sort of production/quality-control issue that affected the stock of 365 Almond Milk in early/mid-2013. Some batches were good, some were bad, then it was pulled from the shelves for 1-2 months. It appears that something has changed in this latest batch. We have tested 2 cartons of the “Expires in June 2013” Almond Milk and they are not foaming at all (collapsing soap bubbles). We still have some “Expires in May 2013” that foams well. So for those trying it out for the first time, you may be out of look for the refrigerated stuff. I suggest that you buy the smaller $1.99 non-refrigerated version. We have tried several of the ones that “Expires in Nov 2013” and they foam very well. However, the “Expires in Dec 2013,” “Expires in Jan 2013,” and “Expires in Feb 2014” have not foamed well at all. May 2013: We’ve tried the next batch of refrigerated Whole Foods Organic 365 Almond Milk (with expiration dates in July 2013) and it’s back to foaming. The foam is rich/creamy again but is a bit wetter than it used to be. This makes a really good cappuccino, but if you are looking for a dry cappuccino, you might want to stick with Almond Breeze for now. June 2013 – OOS? 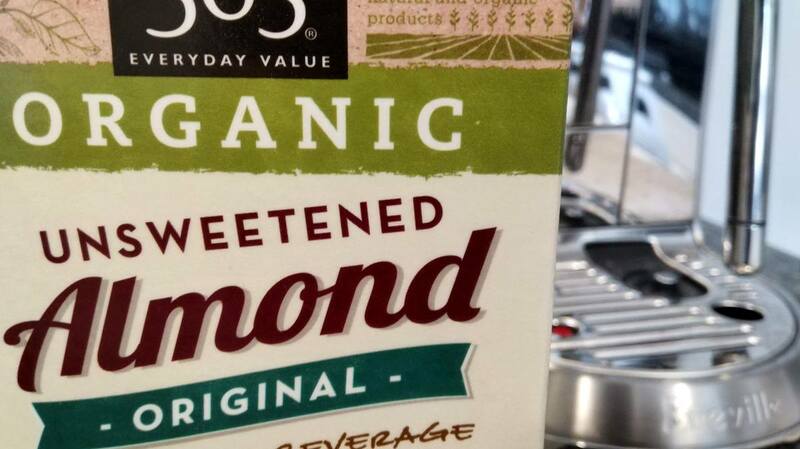 : As of early June, it seems that now there is a production problem with Whole Foods 365 Organic Almond Milk and some stores don’t have any of the refrigerated in stock at all. Our local store is completely “out of stock” though no one at the store knew why. Whole Foods says that it’s just an out-of-stock issue with their supplier. Will keep you posted on any details that we hear. August 2013: Finally! It’s back in stock at our local stores. We’ve heard some mixed feedback here about the recipe, but so far we’ve liked it. Our primary use is for foaming milk to use in coffee and we are glad to saw that the new recipe is back to actually foaming and foaming well. As of August 2013, it’s back on the shelves and so far so good. 2018: As of 6/2018, whole foods has introduced a new carton design an along with it has a new formula for their almond milk. This new formula is not as good. We tested side by side with the “orange” and new cartons. The orange carton (365 Original Unsweetened) was great, but the new carton consistently gave us foam bubbles. 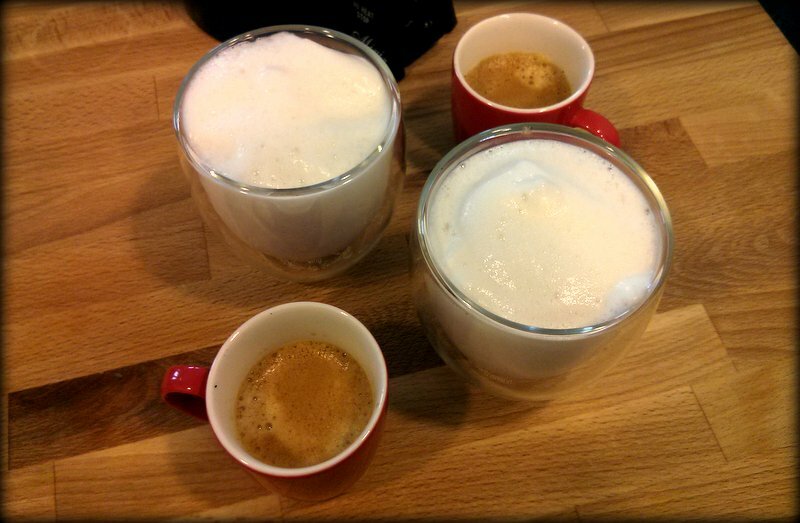 In 2014, we switched to the Nespresso/DeLonghi machine with built in frother. Just as Whole Foods seems to have been taking out of the game (still not sure why) – Trader Joe’s has come back. Their latest batch that we’ve tried Oct 2014 seems to be creating that rich foam again. Let’s hope this lasts. Still this poses the same question that we have about Whole Foods, Trader Joe’s, etc.. Is there a quality control issue going on here or is it just a fluke? Does anyone have any insight? Note: For those that are interested, unless otherwise specified, the milks listed do not have any Carrageenan in them (a somewhat common ingredient to soy, coconut, and almond based milks). 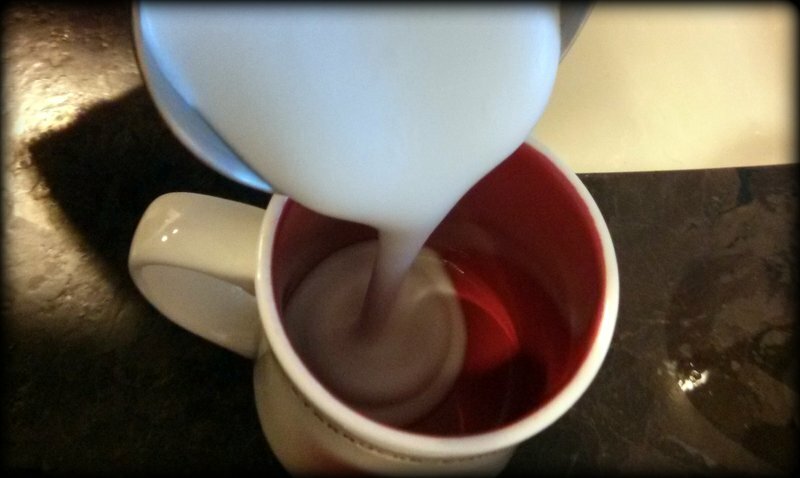 The Portable Chef – Why Won’t My Milk Foam Up, Dammit?